The small decisions we each make daily don’t often add up to life changing events, but for Paralympian Steve Emt, two seemingly small decisions altered his life. The first was his decision to drive after a night of drinking with friends which led to an accident, leaving him paralyzed. And the second was to go for some Pie in the Sky! Paralympic Curling Coach Tony Colacchio spotted Emt on his way to Pie in the Sky, a Bakery & Cafe, in Falmouth, MA and introduced himself. Coach Colacchio felt that he could make Emt a Paralympian in curling. Emt, a basketball athlete at UConn, who was unfamiliar with the sport at the time. However, Emt loved it from his first time on the ice. As a math teacher, Emt said curling is "everything I love about math, everything I love in life all in one sport. There are angles and math and geometry and physics involved. There's ice melting. There are concentric circles." Emt performed solidly in the Paralympics against Great Britain as NTI watched with baited breath with every strategic move throughout the events in PyeongChang! Curling coverage continues through Saturday on the Olympic Channel as USA takes on Slovakia tonight. Just like Tony Colacchio coached Emt toward the Paralympics, NTI can coach your job journey. If you are on SSI or SSDI and looking to get back into the workplace, NTI can help through their job services. Register today at goo.gl/Yxcpp6 and reach the top of your podium. 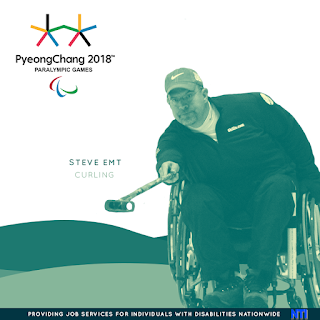 Photograph of Steve Emt playing Curling with a light green/light yellow overlay. The background has wave like elements in 4 different shades of green. In the top left is the logo for the winter Paralympics. 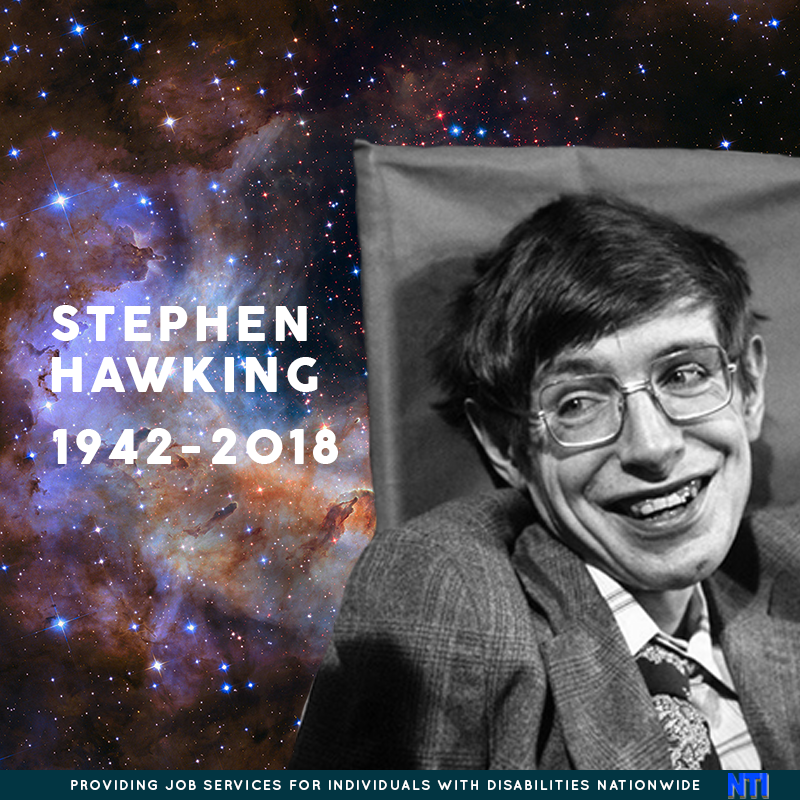 As a non-profit focused on the strengths of individuals with disabilities, NTI is sad to note the passing of Stephen Hawking. 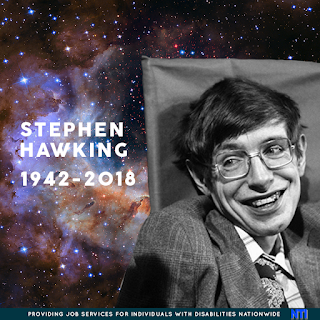 Hawking leaves the world mourning the loss of this brilliant theoretical physicist. He gave the world so much! Although limited in body from the age of 21 by ALS (amyotrophic lateral sclerosis, also known as Lou Gehrig's Disease), his mind probed the very edges of our human ability to comprehend the world we inhabit. "I try to lead as normal a life as possible, and not think about my condition, or regret the things it prevents me from doing, which are not that many," he wrote. His extraordinarily “normal” life enriched the lives of countless millions of people around the world, and he deserves a place of honor in the annals of history! A black and white image of a young Stephen Hawking smiling. The background is a picture of space. Text to the left of him reads "STEPHEN HAWKING 1942-2018"
Paralympian Josh Pauls was born without tibia bones, the larger of the two bones that make up the lower leg and supports most of a person’s weight. Because of that, he had both of his legs amputated when he was only 10 months old. He first tried sled hockey when he was 9, but he didn’t like it because it wasn’t like the ice hockey he saw able-bodied teams playing. But when he tried is again less than a year later, this time without the extra weight of his prothetics, he felt the freedom of sliding on the ice and fell in love with sled hockey! 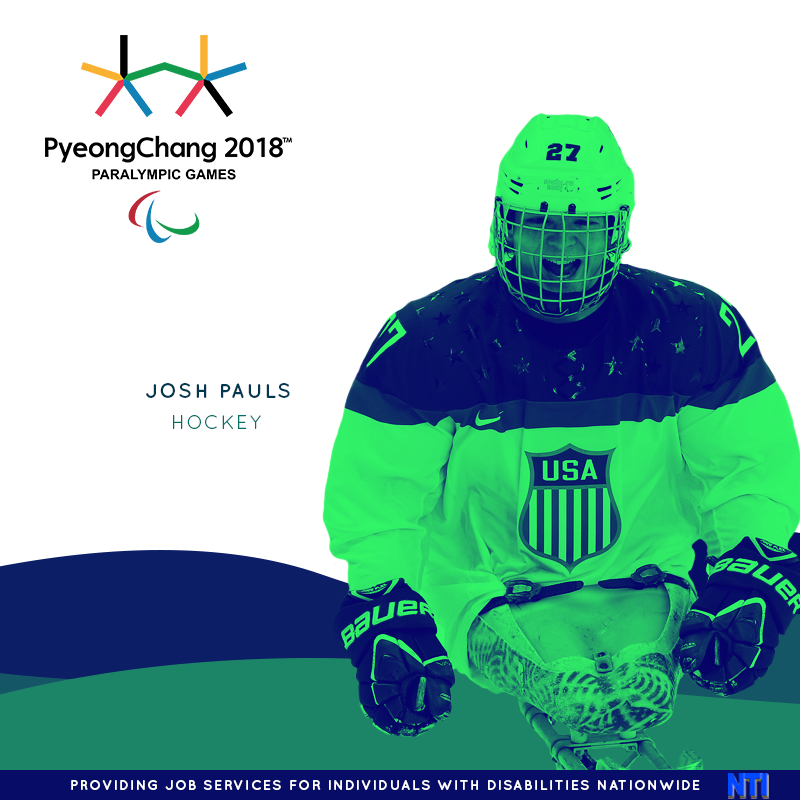 Pauls won gold in the 2010 and 2014 sled hockey Paralympics and is hoping to lead Team USA to yet another gold as team captain at the 2018 Paralympics in Pyeongchang this week. He hopes his years of experience in sled hockey will someday enable him to coach ice hockey at an advanced level, even though, as he likes to joke, he never had to learn to skate. Pauls is an advocate for inclusion in hockey and enjoys playing on sled teams against able-bodied teams! NTI wishes him and all of Team USA best of luck! Sometimes, skill is more necessary than luck, but also having the right guidance is key. At NTI, we help individuals with disabilities and disabled Veterans get back into the workplace through our job services. If you are on SSI or SSDI and interested in being a part of the workforce once again register for NTI at goo.gl/6T4xsF Maybe we can help? Photograph of Josh Pauls playing hockey with a dark green/blue overlay. The background has wave like elements in 4 different shades of blue. In the top left is the logo for the winter Paralympics. Meghan Lino was born with spina bifida, a congenital disorder affecting the brain and spinal cord. She began using a wheelchair in the first grade when walking became increasingly difficult. But Lino credits her family with always pushing her “to do things that may not have been easy to do.” Her family has always supported her while respecting her independence, and they will be watching as Lino competes in her second Paralympic Games for Team USA in wheelchair curling in Pyeongchang this week. She began curling in 2009 in Cape Cod and quickly became serious about competing on a team. She attended the last Paralympic Winter Games in 2014 in Sochi. Wheelchair curling was first included in the Paralympics in 2006, and is one of the few sports to include a mixed team with male and female competitors. Wheelchair curling differs from traditional curling in that there is no sweeping, a term used to describe actions to affect the direction of the stone once it has been released. NTI wishes Lino and the rest of her team best of luck as they compete against 11 other countries for the first-ever medal for Team USA in wheelchair curling! You can be on the podium too! Over the years, NTI has helped quite a few individuals with Spina Bifida get back into the workplace through our job services. If you know of someone on SSI or SSDI who is looking to get back into the workplace, feel free to have them register at goo.gl/bphZh6. Photograph of Meghan Lino in her wheelchair playing Curling with a yellow/orange overlay. The background has wave like elements in 4 different shades of orange. In the top left is the logo for the winter Paralympics. 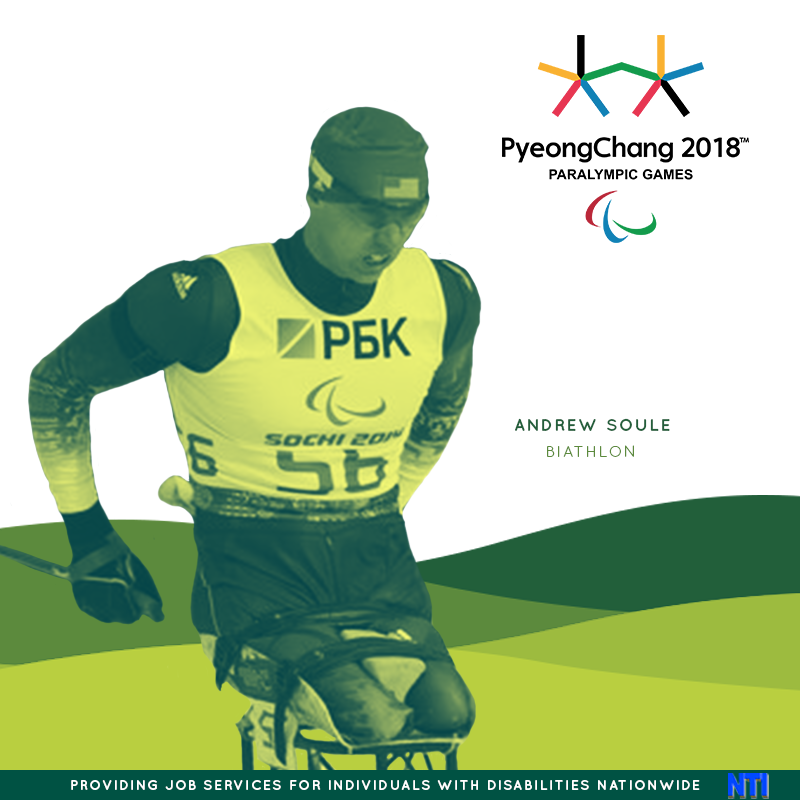 You may have heard the successes of recent Paralympic Gold Medalist Daniel Cnossen, but have you heard the story of his teammate and most recent Bronze Medalist Andrew Soule? Three-time American Paralympian Andy Soule is no stranger to dedication and love of country. Following the terrorist attacks of 9/11, Soule joined the Army and was deployed to Afghanistan. In 2005, a bomb exploded while he was on a security patrol and his legs were badly injured, requiring amputation. During rehab, in order to stay active, Soule began handcycling and attended an adaptive camp where he tried skiing. A natural on the slopes, within a year Soule moved to Sun Valley, Idaho to train full-time. He competed in the 2010 Paralympic Winter Games in 2010 in Vancouver where he became the first ever American to win a medal as a biathlete in either the Olympic or Paralympic Games! He competed again at the 2014 Winter Games in Sochi, and now will be competing for the third time as a Paralympian in PyeongChang. Soule competes in a sit-ski, a specially designed seat attached to two cross-country skis, and he propels himself with poles. As a biathlete who must not only ski well but shoot well, his military training is as asset. Most Olympic biathletes who shoot after competing in grueling Nordic Ski courses have to calm their shaking legs in order to shoot straight. But in the case of many Paralympians, they have to do it all with their arms, making the feat even more impressive. We are proud of your Paralympic accomplishments Andrew and thank you for your Service in the military! Just like Andrew, something is thrown your way and you need to adapt, just like the people who have come to NTI. Something happened in life that caused a disability, but they make a comeback. If you would like to make a comeback and use NTI's services to get your next job, visit NTI at goo.gl/ETDL59. Photograph of Andrew Soule alpine skiing with a dark green/line green overlay. The background has wave like elements in 4 different shades of green. In the top right is the logo for the winter Paralympics. March is Brain Injury Awareness Month and this week is also Brain Awareness Week. An estimated 1.7 million sustain a traumatic brain injury annually. Of the 1.7 million, 52,000 die, 275,000 are hospitalized and 1.365 million are treated and released from an emergency room. About 75% of the brain injuries that occur each year are due to concussions. There are short-term and long-lasting affects from brain injury and Brain Injury Awareness Month focuses on destigmatizing brain injury and empowering those who have had survived a brain injury through support. In fact there are over 680 events over the course of Brain Awareness Week to help educate people with Brain Injury (dana.org/baw/calendar). BrainFacts.org (bit.ly/3DBrainTour) or learn a bit about the current research ongoing at MIT at the McGovern Institute for Brain Research at MIT (http://mcgovern.mit.edu/). Life after a traumatic brain injury can be difficult, but NTI has helped many on SSI or SSDI get back into the workplace once again when they are ready. If you would like to explore the services NTI has to offer, visit our website at goo.gl/6kSi13. Maybe we can make a difference in your life or someone you love? The image is an illustration of a green brain in the center with two band aids placed on top with 6 lightning bolts around to symbolize injury and a pastel green background. Did you know that 120,000 Americans are blind as a result of glaucoma, which accounts for nine to twelve percent of all cases of blindness in the United States. However, roughly 2.2 million Americans have glaucoma, but only half know they have it. On World Glaucoma Day, we encourage people to take preventative measures by getting regular eye and optic nerve checkups to prevent eye diseases that are permanent. During World Glaucoma Day, NTI opens eyes for opportunity to get back into the workplace with our job-services. Create a vision for yourself with a new job opportunity. If you are on SSI or SSDI and would like to get back into the workplace, visit and register for NTI's job services today at goo.gl/s2p7QV for an eye opening experience. The image is an illustration of an eye with a green illustration of earth as the pupil. Underneath the eye is text that read "WORLD GLAUCOMA DAY" with "GLAUCOMA" in green. There is also a green border around the image. Born with a congenital limb deficiency, Declan Farmer had to have both legs amputated at an early age, and he first learned to walk using prosthetic limbs. An avid sports fan for as long as he can remember, Farmer sought out opportunities to test his natural athletic ability. He found his niche in sled hockey, a variation of ice hockey using a sled instead of skates and requiring two sticks with a pick on each end to propel the sled across the ice and hit the puck. From the first time he got on a sled at age 8, Farmer’s talent was apparent, and he has even been compared to ice hockey legend Wayne Gretzky. He competed on the Tampa Bay Lightning Sled Hockey Team from 2007 to 2013, and he has been part of the US national team since 2012. His extensive experience, competitive nature, and natural athletic ability means he is not at all flustered by travel and intense competition. 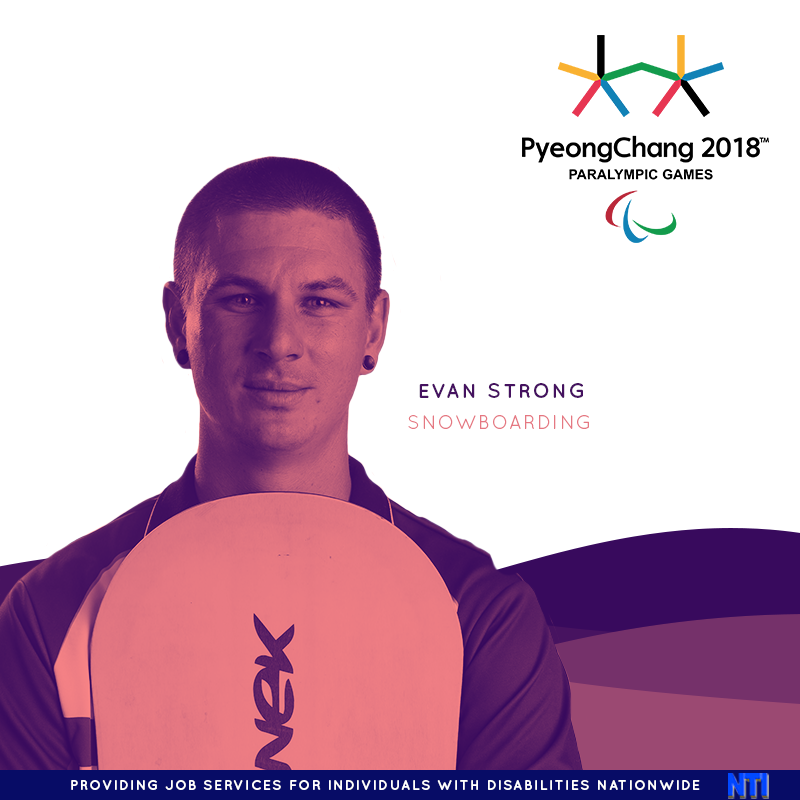 In 2014 at the age of 16, Farmer competed in the Winter Paralympics in Sochi where he assisted in leading the team to a gold medal, and now in 2018, at age 20, he is poised to lead Team USA to another gold! Following the Paralympics, Farmer plans to return to Princeton where he is studying for a degree in economics. But he plans to return again and again to lead team USA to a gold medal in sled hockey in future Paralympics! Declan pushes himself to the limit in his sport, just like the many of the people we help at NTI who strive to get back into the workplace. If you are on SSI or SSDI and would like to explore the job services NTI provides, visit NTI at goo.gl/UakTrW. It only takes about 5 minutes to register. Brenna is now 22, a mother of a beautiful baby girl born in May of 2016, and poised to bring home gold in two separate Paralympic events--snowboard-cross and the banked slalom. Brenna, we wish you luck in the in Pyeongchang! Just like Brenna, many of the people we help at NTI have to handle many of the challenges life places in front of them, such as balancing a disability, work, and parenthood. We understand at NTI. If you are on SSI or SSDI and would like to explore the job services NTI provides, visit NTI at goo.gl/PikNHj. It only takes about 5 minutes to register. We congratulate Andrew Kurka for winning a gold medal in the sit-ski downhill race in the 2018 Winter Paralympics! A dream come true! From the age of eight, Alaskan Andrew Kurka dreamed of being the best in the world. Even at that young age, he was recognized as a gifted athlete and excelled at wrestling. When his coach told him to remember that there would always be somebody better, young Kurka just strengthened his own resolve, determined to move to the top and be the best. His plans were sidelined at the age of 13 when a four-wheeling accident broke his back and left him paralyzed. His physical therapist, recognizing Kurka’s athleticism and competitive spirit, suggested he try a Paralympic sport. Andrew chose skiing. He understood that he could compete at a Paralympics and be a competitive athlete, he decided to dedicate himself to his dream of Alpine skiing as a true Olympian! Although he has had setbacks like most athletes, including three broken bones from flying down a mountain at up to 70 miles an hour, he is poised to medal at the 2018 Paralympic Games in Pyeongchang. He qualified for the Paralympic team in 2014 in Sochi, but crashed during a training run right before the event and re-injured his back. Unable to compete during at the 2014 Paralympic Games, he kept his dream alive and is ready mentally and physically to give the 2018 Games his best effort! He is currently ranked the number one seated skier in the world. Kurka has trained extensively for this opportunity and hopes that by competing in an independent sport vs. a team sport that he will be able to reap the benefits of his hard work and training regimen. He is glad to be competing as an Alaskan because he expected to bring a medal—a first for any Paralympian from Alaska. Congratulations Andrew on this amazing accomplishment! Just like Andrew, something is thrown your way and you need to adapt, just like the people who have come to NTI. Something happened in life that caused a disability, but they make a comeback. If you would like to make a comeback and use NTI's services to get your next job, visit NTI at goo.gl/oJZXwq. When the Chernobyl Nuclear Power Plant disaster happened in April of 1986, no one alive at the time could imagine the catastrophic consequences for the lives of as yet unborn children that would continue for decades after the event. And though all the stories of affected children are worth sharing, one in particular stands out as we start the 2018 Paralympics! Born in the Ukraine three years after the Chernobyl Disaster, Oksana Masters had significant birth defects including six toes on each foot, five webbed fingers on each hand and no thumbs. In addition, her left leg was six inches shorter than her right and both legs were missing shin bones. After living in three different orphanages, she was adopted at the age of 7 by Gay Masters, an American university professor with no children of her own. Eventually, both of Oksana's legs were amputated above the knee—her left at age 9 and the right at 14. Both hands also had extensive reconstructive surgeries. At age 13, Oksana became interested in rowing after she found a sense of freedom while on the water. In 2011 she joined the Para-rowing team in 2011 and went on to win a bronze medal in rowing at Paralympic Games London 2012. After an injury that prevented her from rowing, Oksana learned to ski and qualified for the Nordic Skiing Team at the 2014 U.S. Paralympics in Sochi, Russia. She brought home silver and bronze medals that year. But three medals in two very different events were not enough for this amazing athlete. In 2016 she competed in the Paralympics in Rio and earned a 4th and 6th place finish in hand-cycling. Currently she is pursuing another Paralympic Medal in Nordic Skiing at the 2018 Paralympic Winter Games PyeongChang. Keep an eye on her, as she hopes to bring home a gold! Now that the Winter Olympics has come to a close, the 2018 Paralympic Winter Games are just kicking off in PyeongChang. The opening ceremony will be held at the PyeongChang Olympic Stadium at 8 p.m. this Friday, March 9th. The slogan of the Paralympic Winter Games, “Passion Moves Us” focuses on the passion that motivates everyone; including those who have disabilities. Over 670 athletes will be represented from 80 countries as opposed to 539 from 4 years ago. The total number of female athletes has tremendously increased by 44 percent. 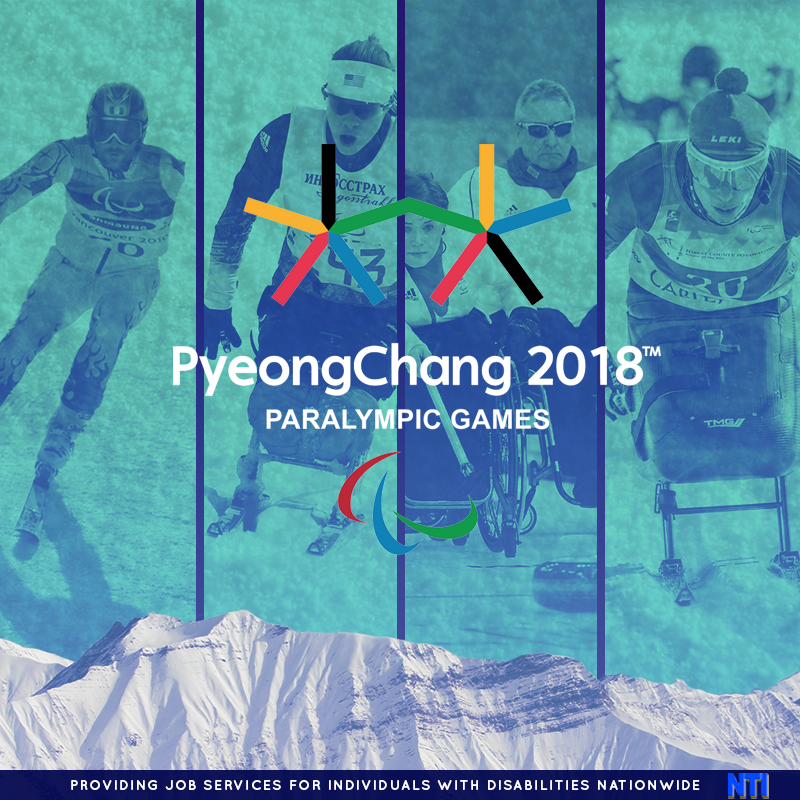 This Paralympics, athletes will compete in fifteen sport disciplines consisting of 4 snow sports: Alpine Skiing, Biathlon, Cross-Country Skiing, and Snowboarding. In addition, two ice sports, Ice (Sled) Hockey and Wheelchair Curling will be included in the competitions. Eyes will be on US competitors Oksana Masters (Biathlon), Andrew Kurka (Alpine Skiing), Brenna Huckaby (Snowboarding), Andrew Soule (US Nordic skier), and Declan Farmer (Ice Hockey) as they strive for Gold. 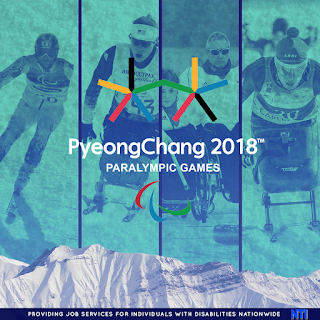 You can watch coverage both on NBC as well as the Paralympic website at https://www.pyeongchang2018.com/. The Winter Paralympics will take place from March 9th to March 18th. We hope you enjoy the highlights that NTI brings of the Paralympic Games over the next few days. What aspects of the Winter Olympics are you looking forward to?